The first volume in a planned four-part series, this lavishly illustrated book looks at Perriand’s early life: her education, her work in photography, her early interest in pre-fab residential architecture, and her years spent working with Le Corbusier at his studio on the Rue de Sèvres in Paris. While most are familiar with Perriand’s game-changing design work, the book also documents her less widely known involvement with leftist groups and her desire for social change that drove her to create affordable and appealing furniture for the masses. Influenced by this and her participation in the International Congresses of Modern Architecture, Perriand turned in the 1930s to more inexpensive natural materials like cane and wood. 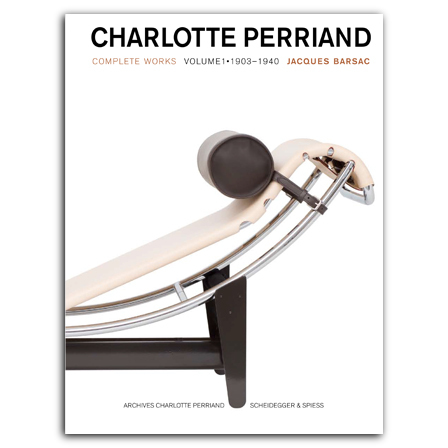 Complete with annotations and a bibliography for further research, Charlotte Perriand offers the first comprehensive book in English on this key figure. has directed a number of internationally successful documentary films on historic personalities, such as Charlotte Perriand, Le Corbusier, Jean Cocteau, and Winston Churchill. Since 2001 he has been carrying out extensive research on Perriand’s life and work. , born 1942, is professor emeritus for architecture and building construction at the Swiss Federal Institute of Technology Zurich (ETH Zurich). He took his degree in architecture from ETH Zurich in 1967 and ran his own studio ARCOOP in Zürich 1971–98. He has published widely on architecture and architectural history in books and journals and is a renowned expert on the work of Le Corbusier.